Choosing the best litter box for cats isn’t as easy as you might think. When choosing the best litter box for cats, some things have to be kept in mind, such as your cat’s age and size, temperament and habits. The number of cats in your household also bears some weight in your decision. Kitties are rather particular about their bathroom habits, so making the right choice of the litter box is really essential for your cat’s well-being. You should also keep in mind if it is already litter box trained, or you have to start from scratch. A cat’s litter box is what a bathroom is to you and me. It would not be an ideal bathroom if while you’re using its facilities, you get people passing by, perhaps stopping to have a look, or even pull a face at what you could be doing. You also certainly wouldn’t want any of them to faint if they whiff certain odors you are emitting at the time. Cats are prone to these same situations, but they are not really bothered about us fainting due to the pong that is emitted out of their little behind. However, you have to take into consideration certain things when making your choice. Some of these you would not even normally think twice about, but they may very well have a tremendous impact on your little kitty. Luckily enough, cats tend to go for their litter box out of instinct, so getting your cat to actually use it should not be too difficult to achieve. Your type of home is also an essential parameter in your choice of getting the best litter box for cats. If you live in a large house, then you can practically get whatever type you really need. You might not even feel you need one in the first place if you have a huge garden. It would, however, be a good idea to keep an eye out where your cat is doing its business, and keeping this contained to your own garden, and not let kitty wander over to your neighbor’s prized flower patch. As much as good neighbors go, you will end up in their black books if your feline decides to dig their garden up instead of yours. But if your house is somewhat cramped, or you live in an apartment, or in the city, you would then need to adjust to your living circumstances and space availability. Luckily for you and your cat, there is a huge variety of litter boxes to suit all the possible circumstances you can think of. There are good ones, there are better ones, and there are great ones, but you would have to make the choice of what is suitable for you both. An advantage to this is that litter boxes won’t break the bank, so if something should go South with your choice, you could always invest in another one. You won’t need to throw the original one out, as your family of cats might get bigger, and you’ll be thankful you have a second litter box at hand. Another thing you need to keep in mind is how much time you really have at your disposal. Time is an essential factor when you come to do the nasty deed of cleaning the box out. There are variations of litter boxes which you can get out of doing that, to some extent, and it’s not called cheating; it’s called a necessary evil. A word of warning: If the litter box isn’t kept clean or not kept in a suitable place, no matter how much it cost you, and how great it looks, your cat will end up not using it. One of the most convenient, simple, and economical cat litter box to buy is one by Luuup. I was particularly impressed by this product because of the sheer simplicity by which it can be cleaned, and also because you will not waste ‘good’ cat litter in the process. You have been there and done it. You wish you didn’t have to go there and do it, but if you must, then at least you can do it the right way. This is an easy to clean cat litter box, and also economical. These are perhaps the most straightforward types of litter containers available for cats. They are also referred to as boxes, even though they really aren’t a box as such, as all it is is an open tray. In such a box, all your kitty has to do is step in it, do its thing, then step out again. Nothing could be simpler, and when considering its simplicity, it is relatively easy to clean. It is also the cheapest way for your cat to have its own bathroom. With such a litter container, there are also cons. They are nothing to be alarmed about, but if your cat enjoys making a mess, then this is the best type of box for it as all the litter will find itself all over the floor, especially if your cat enjoys digging for victory. Another possible problem is that the contents are always visible, and the smell isn’t contained. This obviously would depend on where you place the tray in the first place. If it’s out of everybody’s view and sense of smell, this type of litter container is all you really need. The Petmate Litter Pan comes in a new design and adds strength and handling improvement when loaded with litter. Smooth edges. Side grip for easy handling. Four Sizes: Small, Medium, Large, Jumbo. Four language packaging. Assorted pack Blue Mesa and Mouse Gray. Made in the USA. Petmate creates safe, quality goods for your pets. Keep your pets active, healthy and safe with these toys. Helps your pet stay engaged and more obedient. Extra-large capacity, high walls, great for larger cats or multiple cat households. It has a deep wall design which reduces litter scatters, and it’s designed to maximize retail shelf space. Petmate Giant Litter Pans offer a great solution for large or multiple cats. The large size and high walls contain waste and scatter. This box can hold over 30 lbs. of litter for less frequent changes, so you can spend more time with your cat. Depending on the size and free space available in your home, a standard cat litter pan, or box, might not be really suitable. You could just have a little corner in your home, enough to fit your kitty’s bathroom, and this is where this type of litter box comes into play. It fits beautifully into a corner, and it takes up little space when compared to a normal square or rectangular litter box. Kitangle products were designed to be in plain view within your home. They were also designed to fit into small spaces, into corners, and along walls nicely despite being larger boxes. Kitangle boxes are made of heavy-duty polypropylene plastic with UV protection and are proudly made in the USA. This particular model fits nicely into a corner and looks like furniture in your home. Our 6-inch entrance height is easy for senior cats and kittens to enter. The high sided walls offer great urine and litter containment. Additionally, Kitangle litter boxes have no connections/snaps/lips where urine can hide and dry; this offers better odor control. The lid is optional and removes with ease for cleaning and scooping out used litter. Lastly, most cats enjoy privacy in the litter box and they want to be out of sight. But, if your cat prefers a more open environment, the lid is totally optional. Our unique design feature allows you to lift the top off if desired. The modern angular design still looks nice in your home with the top removed. As a side note, Kitangle boxes can also be used for other indoor pets such as small dogs, rabbits, and ferrets. The NATURES MIRACLE Advanced Hooded Corner Litter Box offers a clean and healthy litter box environment that is ideal for your multi-cat household. IONPURE antimicrobial product protection and Natures Miracle plastic technology work together to inhibit odors caused by bacteria. Any tough or lingering litter box odors are absorbed by the included charcoal filter that works effectively for up to three months. Our space-saving corner design offers more usable space for your multi-cat household and is enclosed to control litter scatters and leaks from spraying. Cleaning your advanced hooded corner litter box is made stress-free with our easy-to-use snap latches (for easy hood removal) and our non-stick surface that eliminates litter caking and odor buildup. Nature’s Miracle Advanced Corner Hooded Cat Litter Box – Nature’s Miracle Advanced Corner Hooded Cat Litter Box is made of advanced plastic technology for outstanding odor control. Odor blocking plastic material guards against the growth of odor. There is really not a great deal to say about this type of litter box. The advantage of using this is that if your kitty enjoys digging and moving the litter around, the contents of the box will remain inside. It’s been designed in a way that a cat can access this without any problems, even if it’s only a kitten. If you have a very big cat or several, then this pan is what you have been looking for all your life. It’s big, really big, and for a cat litter pan, I’d say it’s verging on the huge. The two smaller compartments could hold various accessories that can be used with this pan. The PetMate Giant Linen Litter Pan is designed for easy cleaning. With a 30+ lbs. large capacity, this pan is ideal for larger cats, multiple cats or even small dogs Includes unique side areas for storage of disposal bags, scoops, accessories & more Features a deep wall design to reduce litter scatter Made with Microban, an antimicrobial protection, which helps prevent the growth of stain and odor-causing bacteria. Designed for easy cleaning With a 30+ lbs. large capacity, this pan is ideal for larger cats, multiple cats or even small dogs. It includes unique side areas for storage of disposal bags, scoops, accessories & more Features a deep wall design to reduce. This type of litter box is just right for people whose life is so busy, that finding those few minutes to regularly clean their cat’s litter tray becomes next to impossible. The principle is quite simple and straightforward. Once the cat has made use of its facility, the tray will remove the lumps, which are then stored in a sealed container to be removed later. The advantage of this is that if you are away for a very long time, your kitty will still have a clean litter tray in which to do its business. It works well if you have more than one cat, which would mean that a normal cat litter box will become full very quickly, and this automatic litter box solves this problem. The Littermaid deluxe self-cleaning litter box solves the dirty litter box issue. Automatically keep your cat’s litter box clean all day, every day. The Littermaid litter box automatically scoops the litter and waste into a sealed disposable receptacle to help contain the odor. Eliminates the chore of daily scooping, keep homes smelling clean & fresh by using Littermaid’s Classic automatic litter box. The 14 x 14 compact design is ideal for single cat households that would fit in closets or tight spaces. These are great, especially if you don’t wish to see what your cat has produced. The covers on litter boxes keep everything contained, and to some extent, also the smell. This is super great when you have people at home, but keeping everything contained tends to have its disadvantages. Covered litter boxes aren’t always appreciated by our little feline companions as some will think they are entering a trap. This would make any cat feel uneasy. Also, if you forget to clean the box, passing by it a few times won’t help matters as unless you actually make the effort and look inside, you won’t know what state it is in. Well, you will eventually, once you start finding cat pee and poop all over the place. A note on the keeping the smell contained…just remember that cats can smell much better than we can. So, a little whiff to us will seem like an unearthly pong to them, and cats are clean creatures, and won’t do their thing in a ‘smelly’ place. Our Cleanstep is one of the largest covered cat boxes available. The unique design with steps helps remove tracked litter from your cat’s paws. Comes with a free filter and liner in each box. The Roll’n Clean litter box is a self-cleaning litter box that does not require any filters, liners, or electricity. Simply roll the box right on to the top, and roll back again and the patented grate separates the waste from the clean litter, depositing the waste in the pull out tray. The Roll’n Clean Self-Cleaning litter box cleans in just seconds without scooping. Inside the litter box, there is a unique patented grill that separates out the clumped waste, depositing it into the pullout tray. Regular Size, suitable for one cat. Disposable litter tray has a plastic lining that creates a barrier to help protect against leakage. The ScoopFree Original Self-cleaning Litter Box is the only self-cleaning litter box that uses disposable litter trays to provide hands-off convenience and unbeatable odor control. You don’t have to see, touch, or smell messy waste. Petmate kitty komplete features a raised back to help contain litter scatter, includes Microban antimicrobial, scoop, filter & 4 liners, no latch secure lock attaches the hood to the pan. The Catit Jumbo Hooded Cat Pan provides privacy while retaining the litter inside the pan. The large hood lifts up for easy access for cleaning, while the built-in bag anchor helps keep the bag open and frees hand for scooping. Dogs are wonderful pets, but they do tend to act somewhat silly, and actually eating a cat’s poop happens to be one of the silly things! This litter pan is specially designed for those owners who have both dogs and cats at home. While the cat can easily enter, do its business, and jump out again, the way it’s designed makes it very difficult for a dog to get in there. The Petmate Top Entry Litter Pan is designed to keep dogs from digging in the litter. Attached lid makes clean up easier. Generous opening fits cats of all sizes. Non-slip texture on the lid. Special grating on the lid flows litter scatters back into the pan when opened. Built-in handles allow for easy moving and pouring out old litter. Molded-in hook for litter scoop storage. Perfect for PM’s Ultimate Litter Scoop. Made in the USA. Attached lid makes clean up easier Non-slip texture on lid Special grating on lid flows litter scatter back in to the pan when opened Built in handles allow for easy moving and pouring out old litter Molded in hook for litter scoop storage. The Nature’s Miracle Top-Entry Litter Pan provides your cat with unique access to their litter box while reducing litter tracking. This top-entry pan also provides your cat with privacy while keeping most other animals out. Nature’s Miracle litter pans make cleanup easy with non-stick surfaces while the 2-in-1 odor control inhibits odors caused by bacteria. The Nature’s Miracle Top-Entry Litter Pan provides your cat with unique access to their litter box while reducing litter tracking. 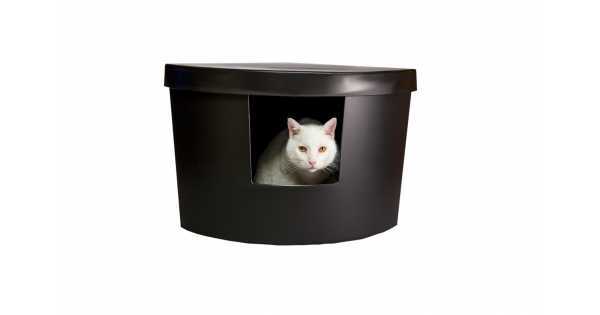 This top-entry pan also provides your cat with privacy while keeping most other animals out. Nature’s Miracle litter pan. So many choices! Which one do you think is best for the person who wants a litter box that requires little or no effort? My son and his wife have a cat, and the litter box …well lets just say that it is never really clean that I notice. I’d like to get them one that they could use and it would be the least amount of work for them. Also, it needs to keep a decent smell, and not have a lot of odors to it. See what you think to it. Apart from it being easy to clean, it’s also economical, but pop round to the article as there are explanations to how it works. As regards smell, well, the clumping litter that you’ll use (this type of box, or pan, only works with clumping litter) should be enough to absorb most of the odors. Let me know if I can be any further help to you, and thank you for your comment. Great post, just like people, every cat is different and will have a preference. Hello, Ellen. Yes, indeed, cats are indeed different from each other. Some are move lovable than others, and they all have their preferences to things, just like people.